Showing recent results 2236 - 2237 of 2237 products found. The Model T753U is a portable, microprocessor based precision Calibrator for Ozone gas instruments and sensors. 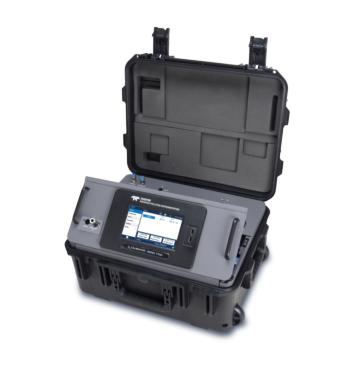 Using a sophisticated Ozone generation system, combined with a sensitive photometer and pneumatic design, the T753U produces stable and reliable concentrations of Ozone in a convenient and rugged package based on our popular T750/U Portable Multigas Calibrator platform. The T753U is housed in a high-density, molded travel case which includes an integral handle and wheels for durability and ease of use in the field for virtually any application. An internal zero air option extends the T753U's capabilities to also provide a clean and dry source of zero air, eliminating the need for a separate source of zero air. The internal zero air source module contains a software driven electronic inlet valve manifold allowing the calibrator to automatically switch between internal and external zero air sources depending on the application needs.The T753U operates in two modes; a high range, and a low range, or "fractional" mode, for producing accurate Ozone levels down to 2 ppb which meets the latest US EPA calibration requirements for Trace-level Ozone gas instruments. The mode is automatically selected based on the Ozone concentration range chosen by the user. To ensure high accuracy and stability of the Ozone output, the calibrator constantly measures the Ozone concentration being produced with an internal photometer and uses it to actively control the Ozone generator in real-time. The internal photometer can be certified by another external Reference Standard by simply using the 'photometer input loop' located beneath the fold up panel. The T753U Portable Ozone Calibrator combines performance and convenience for the most demanding applications. Voltage variable attenuator series offers up to 60 dB of attenuation across broad frequencies. The frequency range of the voltage variable attenuator components is from 400 MHz to 18 GHz. This line of voltage variable attenuators is most commonly deployed in applications such as electronic warfare, instrumentation, point-to-point and point-to-multipoint radios, fiber optic and broadband telecom, microwave radio and VSAT, military radios, radar, ECM, SATCOM and sensors, and R&D.In most communications systems, the RF components used (transmitters, receivers, mixers, multipliers, attenuators, amplifiers, VCO’s, phase locked loops, etc.) may require specific power levels to run optimally. These power levels may differ from one component to the next in a system network. These may require the attenuation level to be finely adjusted to account for changes in received signal levels or to optimally match the input power into a sensitive circuit.Pasternack’s PIN diode-based voltage variable attenuators (VVAs) provide accurate control and broadband flatness where the output level can be adjusted continuously by varying an analog voltage on the input control line. These VVA’s are ideally suited for use with variable gain amplifiers, power level control, feed-forward amplifiers, and automatic level control (ALC) circuits.Like the other over 40,000 RF, microwave and millimeter wave components from Pasternack, this voltage variable attenuator VVA series is in-stock. Not only are these VVA components in stock, they will ship the same day as ordered.